Almost every foodie knows that you should use risotto rice to make risotto…other varieties usually won’t work. 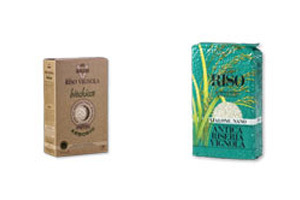 For most people “risotto rice” is synonymous with Arborio rice (preferably Italian)…but did you know that Italy produces multiple kinds of risotto rice beyond Arborio, and that these other varieties can actually make your risotto even better? The two most important characteristics of risotto rice that vary from variety to variety are absorption and starch release. Better absorption draws more flavor into the rice grains, so you get a tastier risotto, while higher starch release results in creamier risotto. Organic Italian Arborio Rice:Arborio is a good, reliable risotto rice. It tends to be the easiest to find and the least expensive. Organic Italian Carnaroli Rice:Carnaroli is the other variety of rice most often used in risotto by discriminating American home cooks. It is harder to find than Arborio, and is often more expensive, but it’s worth the effort because it absorbs more stock (for a more flavorful risotto) while releasing more starch during cooking (for creamier sauce). The grains may hold their shape better during cooking as well, due to a higher amylase starch content. Italian Vialone Nano Rice:Vialone nano rice is probably the most rarely available risotto variety in the US, and has a shorter grain than the other two. Depending on who you ask in Italy (and where they grew up), you may get different answers as to whether carnaroli or vialone nano is the best risotto rice available.What isn’t in debate is vialone nano’s ability to draw in more stock and release more starch than the other two varieties. This results in an incredibly moist, smooth risotto that is particularly prized in Venice because its ultra-creamy texture works so well with seafood. Organic Italian Integrale Brown Rice:Yes, you can make risotto, real risotto, with brown rice. But not just any brown rice will work. Unpearled integrale rice is the variety you want to use, because it behaves somewhat similarly to the other varieties. Of course, because the bran is left on you’ll be getting more vitamins, more fiber, a nuttier flavor and a chewier texture. ● White Truffle Risotto Recipe – check this one out even if you don’t have fresh white truffles…it’s a slightly different (and even more decadent) technique.